Lower Austria is a tourist destination beloved for its beautiful landscapes and proximity to the capital, Vienna. 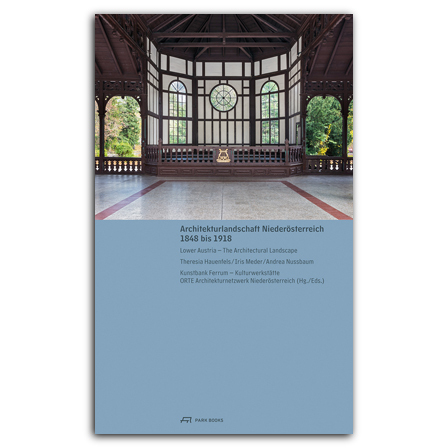 A new architecture guidebook, Lower Austria—The Architectural Landscape, 1848 to 1918 features a selection of significant buildings from that period. Arranged by type, entries include historic and contemporary photographs, brief descriptions, architectural plans, and other information. The seven decades between the Austrian Revolution of 1848 and the end of World War I in 1918 marked several periods of significant societal and political change in Austrian society that also had a major impact on architecture. Detailed essays describe the commissioning of projects—often by famous architects of the time—as they related to such topics as the abolishment of manorialism, the onset of industrialization and the construction of the railways, and the fashion of escaping the crowded metropolis for a summer house in the countryside. is a writer and curator, working in the fields of architecture, visual art, and Austrian identity. is a scholar of history of architecture and a curator with a special focus on central-European modernism. graduated in communication studies and lives and works as a freelance writer in Vienna.